Mini Vitreous Glass Mosaic Tiles 3/8-Inch by Hakatai are sold loose by the half pound (approximately 320+ pieces) for in mosaic art and as an architectural covering. Most of the color names are the same as the larger versions, but they might not match exactly due to variations in manufacturer batches. Suitable for indoor and outdoor use, these are a good choice for mosaic murals and signage. Mounting grids are available for this size. One half pound will cover approximately 0.4 square feet assuming a standard grout gap of approximately 1/32 inch. To cover 1 square foot with the standard grout gap for this size, 796 tiles are needed. Most mosaic mounting paper is 1.15 square feet and requires 841 tiles (29 tiles x 29 tiles). Use our tile estimator to calculate how much you need for your project. Tile thickness is 1/8 inch nominal, the same as most of the glass mosaic tile we sell, which means that these can be used with other types and brands. 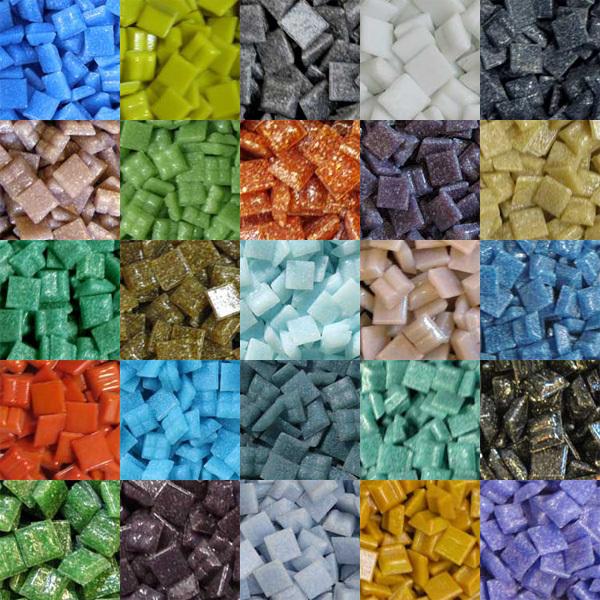 Never assume that colors of different sizes will match exactly even if they have the same name because they might come from different manufacturer batches and look slightly different. The Mosaic Glass Cutter is recommended for cutting all types of glass mosaic tile including these. Note that there is a limit to how small they can be cut because the sides of the tiles are tapered, and small pieces tend to fall over. We cut halves and quarters and diagonal triangles but do not try to go small than that, at least most of the time. If you are making the fine details of your image and need to cut smaller, you can lean pieces against each other, but that can get tedious. You can use these with tiles from different manufacturers if you find you need additional colors because the dimensions are an industry standard. These are economical enough for use in craft projects, but there are enough colors available to render sophisticated images, including naturalistic portraits and landscapes.